Recon Smoked LED Third Brake Light 02-08 Dodge Ram Recon Smoked LED Third Brake Light 02-08 Dodge Ram, Recon 2264112BK 3rd Brake Light, 02-08 Dodge Ram 3rd Brake Light, 02-08 Dodge Ram LED 3rd Brake Light, 02-08 Dodge Ram Smoked LED 3rd Brake Light, 02-08 Dodge Ram Smoked 3rd Brake Light, Dodge Ram Light [Recon 2264112BK 3rd Brake Light] - $109.95 : 3rd Strike Performance, Your Source for Late Model MOPAR Performance Parts and Accessories! 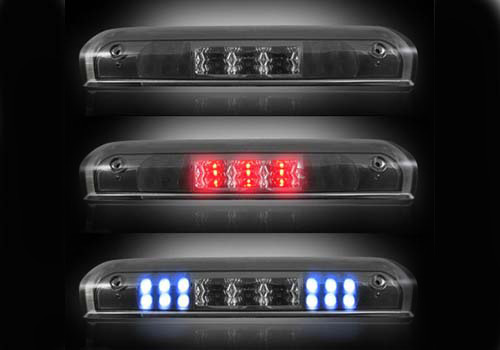 Keep your truck safe and stylish at the same time with an LED Third Brake Light Kit from Recon! Replacing your factory third brake light with super-bright LED lights is an easy and effective way to make your truck that much more visible on the road. Most rear-end collisions occur because drivers can't see the vehicles in front of them. Lower the possibility of being hit by changing out your dim factory light with tested and proven LED lights where you need them most. Recon even makes is easy to match your vehicle's style with a choice of clear or smoked lenses.